Hyderabad: The Krishna Institute of Medical Sciences Ltd (KIMS Hospitals),has received the prestigious “Association of Health Care Providers India (AHPI) Award 2017”in the Patient Friendly Hospital category, for the Telangana region. The award has been given after carrying out an assessment in the month of January 2017. Every year, the Association of Healthcare Providers of India gives away these awards to the healthcare institutions after carrying out a broad assessment of varied parameters of quality and functional excellence indicators offered to the patients by the hospital. 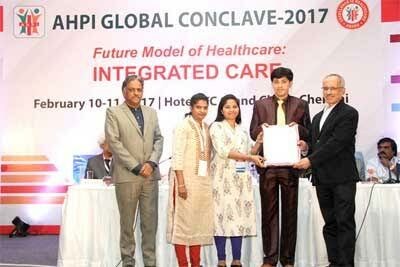 The award ceremony took place during AHPI Global Conclave held on February 10th. Dr Aloke Mullick, COO, KIMS Hospitals, received the award on behalf of KIMS Hospitals from J.Radhakrishnan, IAS, Principal Secretary to the Government of Tamil Nadu. KIMS Hospitals has scored on several parameters including Hospital Website, Access to Hospital, Reception Area, Patient Safety, Patient Feedback and Social Responsibilities to win the award.